Experience the heart of Hood River at Brookside BnB. Adjacent to the award-winning Indian Creek Golf Course, Brookside BnB is a peaceful haven situated on five acres of manicured paradise, with majestic Mt. Hood views, yet conveniently close to all that Hood River and the Columbia River Gorge have to offer. Guests can easily explore Hood River’s vibrant downtown, buzzing waterfront, Fruit Loop attractions, award-winning restaurants, wineries and breweries, and the beauty of Mt. Hood’s forested trails all in a day’s play. But oftentimes, guests find it difficult to leave the grounds. That’s because Brookside B&B is a paradise all its own with mountain views and paved walking paths along a babbling brook to a private pond, outdoor tennis court, and an outdoor artisan fireplace to rest your feet and take in the night’s sky. The three suites are each finely furnished and contain privacy, comfort, and lots of extra touches to make your stay enjoyable and unforgettable! Enjoy luxurious outdoor seating on our circular patio. Hang out in the garden and nibble some herbs. Drink Champagne with a view of Mount Adams from our Honeymoon Suite Hot Tub. Enjoy a breakfast made from locally raised free range eggs and organic produce grown in our own garden. Stroll through our vineyard and enjoy award winning wines produced by our neighbors at “Cathedral Ridge Winery” located next door. Take a hike or bike ride up Post Canyon Drive and explore endless trails to burn off your breakfast. Our Inn has four guest rooms and sleeps up to 12 people. The family suite sleeps 6, has a private half bath and is great for parents and children. The queen room sleeps 2, has a lovely window seat perfect for curling up with a good book. The twin room has two twin beds, sleeps 2 and shares a full bath with the queen room. The Honeymoon Suite has a private full bath with indoor hot tub and shower for 2 with a generous walk in closet and mini-fridge. All rooms have TV, wireless internet and DVD players. Host up to 200 people for an unforgettable wedding or rehearsal dinner. We also sponsor corporate retreats, family reunions and parties. Call us today at 541-400-9665 to arrange an impromptu weekend of fun or to schedule your wedding or family gathering. Relax in quiet luxury while overlooking Dominio IV’s Estate Vineyard. Three Sleeps Vineyard is the source of Dominio IV’s Syrah and Tempranillo. If you choose, enjoy a glass of wine with the Inn-keepers on one evening of your stay. The B&B offers two rooms, one with a king bed and the other with a queen bed. Each room features it’s own entrance, private bath, cozy seating area, satellite TV with HBO and DVD. Coffee/Tea bar just outside your door. 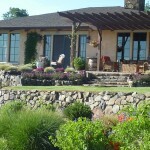 Relax on your own patio enjoying the view of our vineyard and Mosier’s world famous cherry orchards with Mt. Adams in the background. Start each day with a hardy breakfast complemented by local seasonal fresh fruits. Vineyard tours are available and can be arranged upon arrival. Mosier is located strategically between Hood River and The Dalles in the heart of the Columbia River Gorge. The Gorge offers an extraordinary range of activities throughout the year. Check out the Hood River Chamber of Commerce for what’s going on in The Gorge. FOR NONE OF THE HASSLES AND ALL THE BENEFITS OF FARM LIFE…. Located in the Upper Hood River Valley north of the mountain, a fanciful inn nestled at the foot of Mt. Hood in quaint downtown Parkdale. Outdoor adventure, shopping and fine dining are at your doorstep. The complete privacy of the inn and the serene gardens are perfect for romantic and restful getaways. Let the trickling of the garden pond completely relax. Stunning view of Mt Hood from our front gardens. Rooms named with a State Symbol Theme. Named after the state tree of Oregon, the Douglas Fir Suite is enhanced by the quiet beauty of a Pacific Northwest forest and has a breathtaking view of majestic Mt. Hood. Our Chinook Suite, named after Oregon’s state fish, has a sweeping view of the Inn’s Gardens from your private balcony and Meadowlark, Oregon’s State Bird, has large windows that will let in plenty of light in the winter and fresh air in the summer. All have private baths. Play games or relax with a good book in our loft. Laundry facilities are available. Enjoy a hearty breakfast, presenting and savoring Hood River delicacies in our dining room or delivered to your room for complete privacy. The Old Parkdale Inn is equipped with HiSpeed Wireless internet in the house and in the garden. We offer a beautiful, peaceful setting for your weekend getaway, meeting, outdoor Wedding and reception or group retreat. We have 3 rooms and 1 suite to fill your needs. All private baths with TV and refrigerator. Walk through the Gardens or enjoy the Hot Tub, peace and quite is what we offer. Our motto is SO CLOSE — YET FEELS SO FAR AWAY! Enjoy our oversized wrap-around front porch which provides panoramic views of the Columbia river and the snow-capped Mt. Adams. As windsurfers, bikers and hikers we can provide tips on local activites and up to the minute wind and sports reports. Our rates include a full breakfast daily. Dutch Babies, Huevos Gorge View, Blueberry pancakes, French toast, sumptuous omelettes, homemade muffins, lattes and plently of fresh fruit are all part of our morning fare. We also offer wireless connection for your laptop. Open May 18 until Sep 30 annually, closed for winter. What better way to explore and enjoy this area than from your own private haven? Sleep soundly in your custom log bed draped in luxurious bedding. Curl up with a novel on the porch swing or in front of the fire in the leather chairs. Soak your weary muscles in a bubbling spa tub. Wake in the morning to a tasty, hearty breakfast prepared lovingly just for you! Perhaps you would benefit from a quiet, relaxing retreat from the hustle of everyday life. Refresh your soul with one of our wonderful in-cabin spa treatments. Specialty amenities include candles by the tub, Dead Sea lavender vanilla bath salts, and a welcome snack basket. Gilchrist and Soames spa therapy bath products, complimentary soda, assortment of delicious teas and creamy, hot chocolate. We also have a selection of DVD’s and microwave popcorn for you to enjoy. We are 45 minutes east of Portland, OR. Don’t Pass Snowplows on the Right! DUH!